Book News: U.S. Authors Face Hard Choice When Publishing In China : The Two-Way Also: the winners of the Whiting Awards were announced; Cheryl Strayed's memoir inspires other women to take to the Wild; and Dwight Garner on what makes a critic. 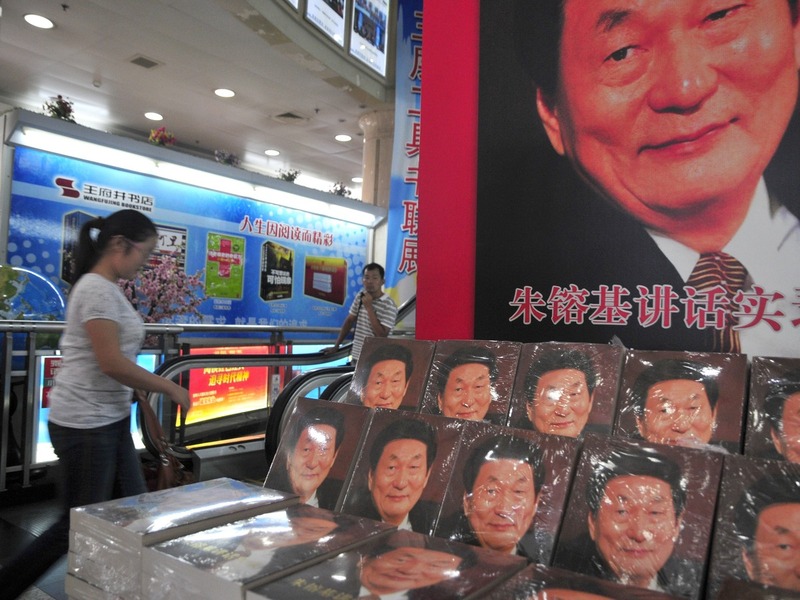 A woman walks past a display at a bookstore in Beijing. American authors are making the tough decision to allow their books to be censored for sale in China, The New York Times recently reported. According to the paper, "authors of sexually explicit works or those that touch on Chinese politics and history can find themselves in an Orwellian embrace with a censorship apparatus that has little patience for the niceties of literary or academic integrity." Publishing houses employ their own censors, which the Times says carefully scrutinize books that mention "ethnic tensions, Taiwan and Falun Gong, the banned spiritual movement, are off limits, and books that contain even a passing reference to the Cultural Revolution or contemporary Chinese leaders." Ezra F. Vogel, whose biography of Deng Xiaoping was cut by censors to present a more flattering picture of the Communist Party, told the newspaper, "To me the choice was easy. I thought it was better to have 90 percent of the book available here than zero." The Whiting Writers' Awards, which honor "exceptional talent and promise in early career," were given to Amanda Coplin, C. E. Morgan, Jennifer DuBois and seven other young writers on Monday. Established in 1985, the $50,000 prizes go to "ten emerging writers in fiction, nonfiction, poetry and plays." Charles Darwin apparently let his kids doodle all over the manuscript of On the Origin of Species. OpenCulture features some of the drawings. In a perceptive essay for The New York Review of Books, Daniel Mendelsohn argues that A Song of Ice and Fire, the George R.R. Martin series that gave rise to HBO's Games of Thrones, is "a remarkable feminist epic." He writes, "This is a mock-medieval epic that constantly asks us not to be fooled by romance, to see beyond the glitter to the gore, to the harsh reality that power leaves in its wake, whatever the bards may sing." Cheryl Strayed's memoir Wild has inspired women to take to The Pacific Crest Trail for a solution to their problems. The Times reports: "Since Wild has appeared, the trail has beckoned to many women who, like Ms. Strayed, needed a change in their lives and believed they might find it on this challenging, sometimes lonely route, seeking the combination of 'promise and mystery' that Ms. Strayed described so enticingly." Dwight Garner speaks to Prospect about becoming a book critic: "Like so many people who write, I started because I wanted to gain possession of the things in my head that, when I opened my mouth, came out all wrong. Words are like little kids; you don't want to send them out of the house until they're dressed and have brushed their teeth. At a lectern I'm a fumbler, the most inarticulate buffalo in the world." On Twitter feuds, he says that "tweet wars are incredibly depressing. It's like battling by throwing one frozen pea at a time."